Experience Costa Rica's pristine beauty at the Tamarindo Diria Beach Resort. Guests can relax to the peaceful sounds of the ocean, wildlife, and nature at the only hotel located on the white sandy beach of Tamarindo. View unforgettable sunsets from the balcony of your room. 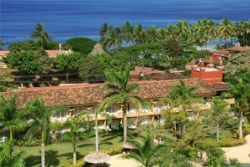 All 238 rooms at the Tamarindo Diria Beach Resort are designed for maximum comfort and enjoyment.